" "Privet!" It mean hello! Here is restaurant that finally persuade me to learn Russian! This restaurant so authentic, waiter bring me Russian menu on accident when I walk in! But I think to myself "nyet, no problem, I can read" and wait for him to figure out! I guess it's no surprise that Terrace Café set up shop 1.5 miles away from the haven of all things Slav, the Russian General Store, even if driving through the palm tree-studded residential neighborhood and up to a ghost-white banquet hall as my GPS says "hot, hotter, hottest" suggested otherwise. You believe the sign mounted in the parking lot that says "WE ARE OPEN" and the chalkboard "Welcome to Terrace Café!" are just Pravda news propaganda when you open the door on the second try and see the building still undergoing "perestroika" while half-under construction, the restrooms off to the side in a completely unused room, and a banquet hall and dining room as empty as your fridge at the end of the month. 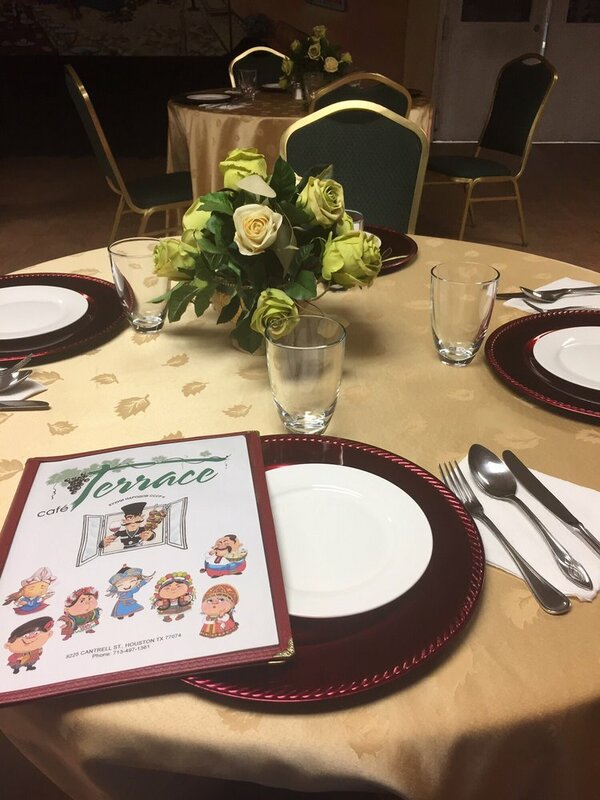 But then the waiter Sergei bids you hello and assuages your confusion about whether you happened upon the audience of the White House Correspondents' Dinner featuring Donald Trump, complete with semi-retro classy seating including flowers and cloth napkins. Even if Houston's April weather is still deciding whether to be kvas season or not, they brew their own kvas in house and thus choosing it as a starter drink was easier than casting a Soviet ballot. Looking and tasting halfway in between Normandy cider, mead and beer, kvas is refreshing in summer or otherwise. Due to basic Cyrillic alphabet knowledge, Russian and Czech cognates, cooking a few Russian dishes, and previewing the English menu, I had little problem reading the Russian menu and deciding on pelmeni (Russian boiled meat dumplings with sour cream) and the diminutive Georgian khachapuri that my friends visiting Tbilisi raved about. Sergei was born in Perm and proved a wealth of information about the background behind many dishes and their traditional preparation methods in Russia and their differences from neighboring countries. I always appreciate a waiter so excited by my enthusiasm that he offers to make something off-menu, like a cabbage pirozhok after I conceded I wanted to try an order of the more traditional meat version, but unfortunately, they had run out of the necessary bread. So I had to settle for just three carb-overloaded specialties, thankful I was working out later on. 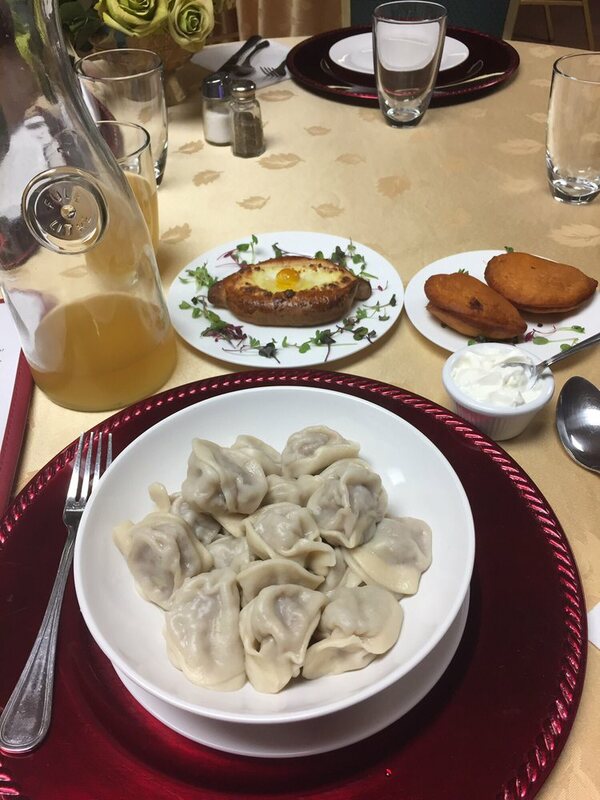 The pelmeni came out steaming hot in their own broth after a 15-minute wait that I gladly shouldered, given that their homemade but frozen stock was empty and they had to make this batch completely from scratch. They were maybe the freshest dumplings I'd ever eaten, although the skins were fragile enough to fall apart when picked up and leave the nugget of meat behind. A full order costs $12 compared to about half that for Chinese dumplings in Chinatown, but there are about 18 of them and the freshly tangy sour cream could have come from their own cows. They are just rough-spun enough to look homemade while being expertly crafted from years of experience and are most highly recommended. Hey Life of Boris, now I want to buy own "Pelmeninator" so at home I can make! 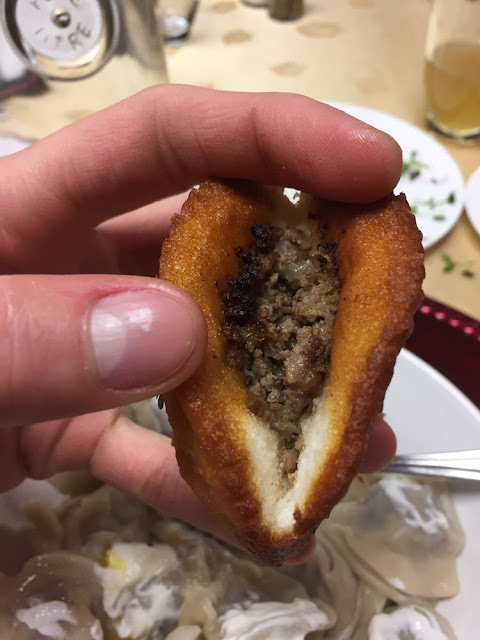 The meat filling in the pirozhki is well-seasoned with pepper, salt, onion and the faintest hint of exotic spice, and the dough crispy as a Nawlins Mardi Gras beignet and not overly greasy. The khachapuri, if rather steeply priced at $8 for a palm-size flatbread, was crackly and the double layer of oozy egg and soft cheese in the middle was an unusual but instantly appealing textural experience. The cute presentation, innocent flowers of various greens twirling around the plate almost like the pretzel-ish crossed ends of the bread itself, betrays the double life of Terrace as a nightclub where, according to Sergei, plenty of breathtakingly beautiful Russian ladies sit waiting for "strong" men to invite them to dance! But Sergei echo advice of Babushka by saying "bring your own vodka" so you not lose your balance on dance floor and get put in friendzone! Perhaps the only issue with Terrace Café is that I wanted to try basically everything, but my bill racked up so quickly that I couldn't try everything I wanted to eat, having to leave behind the Belarusian kolduny (potato pancakes) and solyanka (meat and pickle soup). It clocked in at $37, the third-priciest meal I've ever eaten behind a full Brazilian rodizio and a luxury bouillabaisse on the Vieux-Port of Marseille. Thankfully, Saturday evening dancing night is offered for free, so that perhaps someday you might find a woman who cooks just like this! And based on the absolutely scrumptious food here, perhaps someday one of us will be able to tell someone special "Ya lyublyu tebya" (I love you) by coming inside to both eat and dance the night away! So for now, it is do svidaniya (goodbye), but maybe next time it will be another Privet!